A new device known as an In Situ Chemotaxis Assay (ISCA) acts like a lobster trap for microbes, enabling scientists to capture the tiny organisms in the ocean. Its design is made possible through the use of 3-D printing. A printed rectangular mold acts as the base on which a layer of gel is applied. After the gel cures for 12 hours, raindrop-sized “wells” are cut out and the entire assembly is bonded to a glass slide. 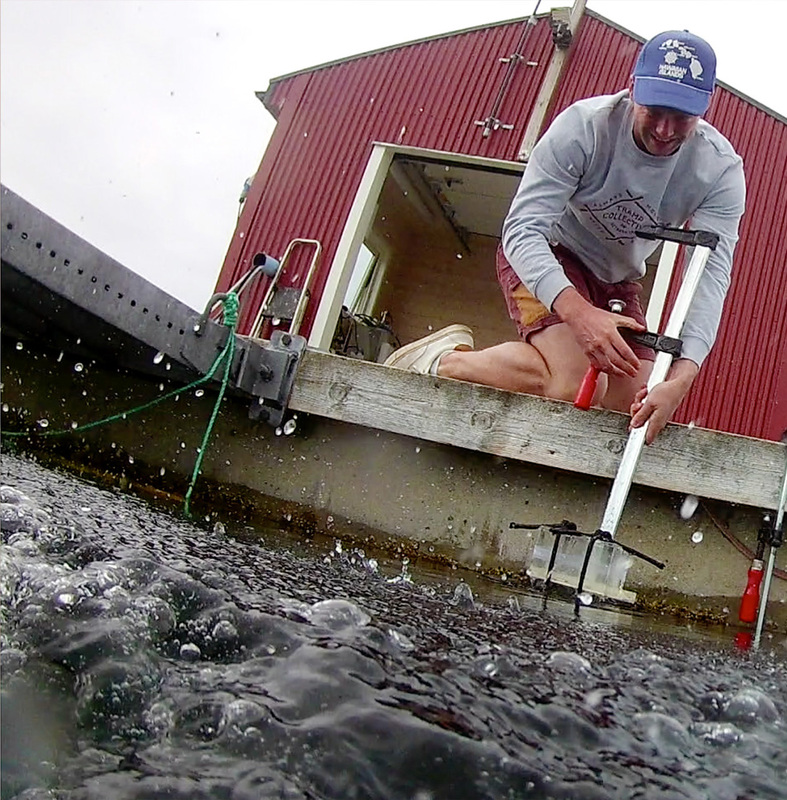 To lure in microbes, scientists fill the wells with chemicals that microbes need. When you sprinkle even a few tiny flakes of fish food into an aquarium, it’s pretty easy to gauge how fish react. They typically swim fast and furiously straight toward the sinking particles and chow down before the food can make it to the bottom. But what if you wanted to observe how microbes in the ocean react to food? These microscopic organisms are the foundation of the ocean’s food web and critical for the health of marine ecosystems. Yet we know surprisingly little about many fundamental aspects of their behavior, such as how they respond when food is nearby or which types they seem to crave. But a new device co-developed by the Woods Hole Oceanographic Institution (WHOI) offers a new window to peer into what happens when microbes get the munchies. The device, known as an In Situ Chemotaxis Assay (ISCA), acts like a lobster trap for microbes, enabling scientists to capture the tiny organisms in the ocean and later analyze them to reconstruct the way microbes physically respond to chemical attractants. At a quick glance, the ISCA looks like a cross between a credit card and a Z-Pak of antibiotics. A closer look reveals several rows of tiny raindrop-sized “wells” that scientists fill with the same types of chemicals microbes need. Co-developed with the Massachusetts Institute of Technology (MIT), ETH Zürich, the University of Technology Sydney, and the University of Queensland, the design is simple, and one made possible through the use of 3-D printing. A printed rectangular mold acts as the base on which a layer of gel is applied. After the gel cures for 12 hours, the wells are cut out and the entire assembly is bonded to a glass slide. MIT-WHOI joint program student Ben Lambert field tests an In Situ Chemotaxis Assay (ISCA) which he developed with other researchers focused on studying the ocean’s smallest scales. The device enables scientists to learn more about how microbes respond to certain chemicals in the ocean. During field experiments, the scientists submerge the ISCA devices affixed to a pole into the ocean, and the chemicals diffuse out from their wells. Then it’s off to the races: Famished microbes get their swim caps on and start navigating toward chemicals they are attracted to. The distance to the nearest food source may be smaller than the width of a human hair, but in their microscale world, even seawater can seem viscous to microbes and make it difficult for them to navigate. Microbes that make it to the chemical bait end up captured in the wells of the device, which the scientists retrieve from the water and take back to the lab. There, the researchers extract DNA from the samples to determine what microbes are there, which chemicals they preferred, and what strategies they employed to navigate through seawater and compete with one another for food. In the future, Lambert and his colleagues will be developing new methods to send the device beyond surface waters into the deep sea. 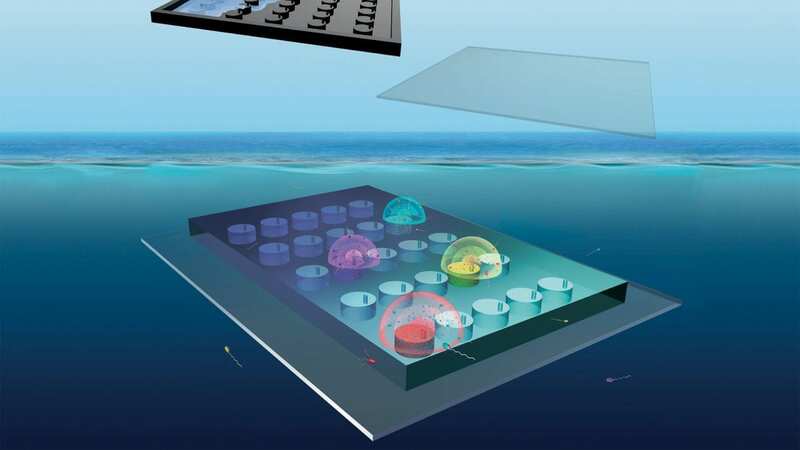 And they plan to coordinate ISCAs with devices that can image microbes under water so they can observe microbes in action as they approach the ISCAs. While the ISCA device is helping Lambert and other scientists understand more about how microbes interact with food sources, it also may be useful in applications beyond oceanography. “We see potential for the ISCA in groundwater bioremediation, where it can help determine which types of chemicals are key for recruiting bacteria that can draw down harmful pollution,” said Lambert.